This filter was formerly named VerifierFilter. The name changed at Crypto++ 5.0. Definition at line 772 of file filters.h. Indicates the message should be passed to an attached transformation. Indicates the signature should be passed to an attached transformation. Indicates the result of the verification should be passed to an attached transformation. Default flags using SIGNATURE_AT_BEGIN and PUT_RESULT. Definition at line 786 of file filters.h. 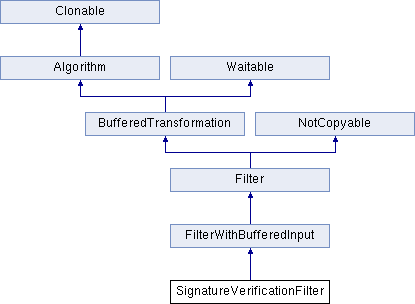 Definition at line 1078 of file filters.cpp. Definition at line 811 of file filters.h. Retrieves the result of the last verification. Definition at line 815 of file filters.h.